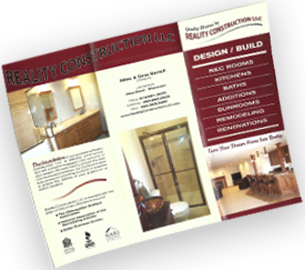 Reality Construction LLC of West Bend, Wisconsin, makes kitchen redesign or your bathroom remodeling project an effortless experience by providing guidance every step of the way. From basement finishing and rec room installation to kitchen remodeling, no other Milwaukee/Waukesha contracting company is more capable of making your greater Milwaukee remodeling project go smoothly. Our counsel in the selection of your amenities is tempered by years of experience in Southeastern Wisconsin rec room remodeling, bathroom remodeling, and kitchen remodeling in Waukesha, Milwaukee, Grafton, Mequon, West Bend, Racine and throughout Washington and Ozaukee Counties. Reality Construction LLC takes into consideration all of your goals and needs when remodeling your kitchen, bathroom, or rec room. Unlike many remodeling companies in Waukesha, Milwaukee, and Washington counties, Reality Construction uses subcontractors who are specialists in their area of home construction and remodeling – from electrical and plumbing to cabinets and flooring, every aspect of your Waukesha kitchen remodeling or Grafton bathroom remodeling project is in good hands with Reality Construction. Other remodeling contractors use many "jack of all trades" type home builders who can do a "pretty good" job in most areas of home remodeling. But they do not achieve the quality and reliability of a true expert in any one facet of the home remodeling process. "The workmanship is superb and we were so pleased that your crew left the area neat and clean at the end of each work day. Your professionals were polite, trustworthy, and more than competent." Reality Construction is professional, timely and presented a very well thought out design and bid for our project. We also continue to be impressed with the high quality materials that were used for the project. The end result is one we can be proud of." "The workmanship and quality of materials appear to be top notch for the cost of the project, which was right in line with other quotes we received. We decided to go with Reality Construction mainly because of their professionalism, eagerness to listen to our needs, and comfortable demeanor." "Our new kitchen is exactly what we had envisioned and more. It looks beautiful. If anyone we know is in need of a contractor, we know that we'll definitely recommend Reality Construction." Our goal is to make your home remodeling experience a pleasant and rewarding one for you and your family as you design, whether it’s your Waukesha basement for a functional rec room, or build an ornate new bathroom with marble counters and an undermount sink, no other Milwaukee area remodeling contractor company will take greater care to meet all your needs and expectations throughout the entire remodeling process. Our professional and experienced West Bend remodeling designers will work with you to answer all of your questions and guide you towards obtaining the kitchen you dream of. The owners of Reality Construction, Mike and Gina, come to your home personally to view your space and get a basic idea of your project. Upon gathering ideas and framing out the project, we'll give you a free estimate of the cost of the job. If our quote is within your budget, we'll take measurements, draw up designs and get back to you with a firm proposal. We'll show you exactly how your finished kitchen, bathroom, rec room or sunroom will look using 3-D modeling software. We will not add on costs to our initial quote. The price you're quoted is the price you pay. You will work directly with our owners all along the way.